Optometry students from Plymouth University have helped local rugby stars to keep their season in focus by conducting free eye examinations. 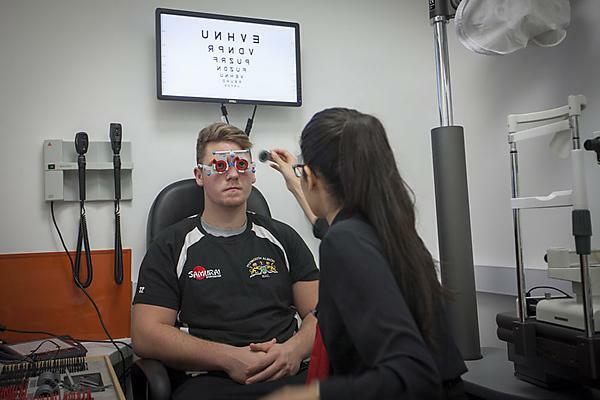 Third-year students put their clinical skills into practice by treating five players from Plymouth Albion RFC at the University’s Centre for Eye Care Excellence (CEE). The players received the examinations thanks to a partnership with the University, which included a detailed assessment of the health of their eyes and screening for conditions that affect the vision. The students were supervised by fully qualified optometrists and used the skills they had acquired throughout their course, from finding blind spots in the field of vision to photographing the optic nerve at the back of the eye. Some of the tests, as is standard for a full examination, took more than an hour and the players were pleased with the thorough nature of the treatment they received. “It's valuable for players to check their eyes out now and then. As for me, I am getting older and want to have the best vision possible playing rugby because if you miss something for a split second you might have missed a chance. The students did many tests on us, first of all asking us to read the smallest text possible, then retrying that same test with different lenses in to see if it helped. Then they shined a light looking for pupil activity, conducted a blind spot test in a dark room and finally took a photo of the back of the eye to see if it was healthy.